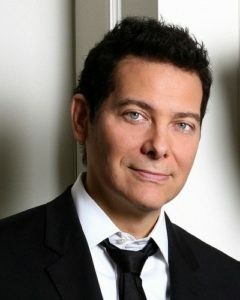 The Carmel Symphony Orchestra will join “the Ambassador of the Great American Songbook” himself, Michael Feinstein, for his April 13 Palladium performance presented by the Center for the Performing Arts. The Wells Fargo Songbook Series concert will be their first joint performance since 2012 and the first ever with CSO Music Director Janna Hymes conducting. Feinstein recently completed his annual holiday stand at his signature New York City cabaret club, Feinstein’s/54 Below. His next album, a collection of high-profile duets, is set for release in the fall. The April 13 performance will be his third time sharing a stage with the CSO, but the first in nearly seven years. Their initial outing was in May 2011, just after the opening of the Palladium, for a concert that was filmed for an Emmy-nominated PBS special. They joined forces again for a February 2012 performance with Bernadette Peters. The concert also will feature alumni from the Great American Songbook Foundation’s annual Songbook Academy® summer intensive for the nation’s top high school vocalists. Tickets for the 8 p.m. performance start at $35 and are available through the Box Office at TheCenterPresents.org or (317) 843-3800. A pre-performance dinner is available for an additional price.